Context: Treatment of chronic infection following total hip arthroplasty (THA) poses challenges in revision and in salvage surgeries such as resection arthroplasty. 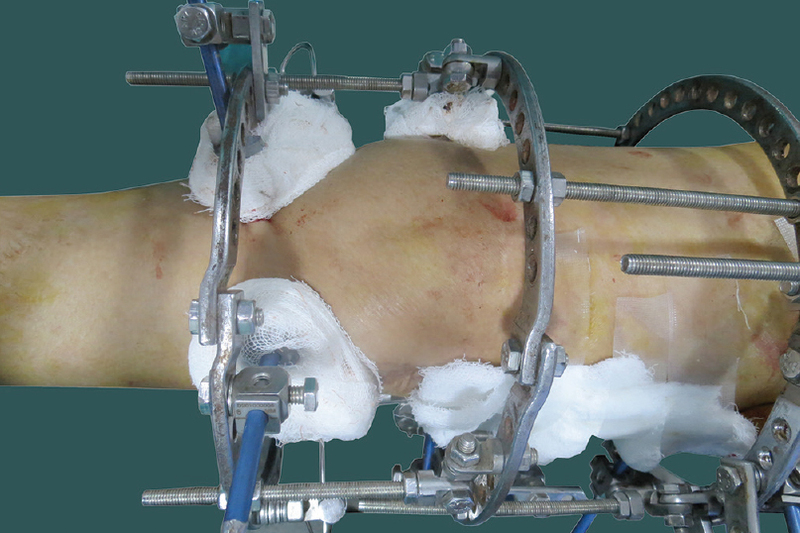 Aims: We evaluated the results and role of Ilizarov fixator in resection and revision for infected hip arthroplasty. Settings and Design: This was a retrospective descriptive study. Subjects and Methods: We reviewed 73 patients treated between 2004 and 2014 with follow-up of 4.3 ± 1.8 years. Forty-three patients underwent two-stage revision (with interim antibiotic spacer), whereas 30 patients underwent Ilizarov-assisted resection arthroplasty. We supplemented eight patients with unstable spacers with Ilizarov apparatus. We evaluated patients for recurrence of infection, hip function and stability. Statistical Analysis Used: Descriptive methods. Results: Eight patients with Ilizarov supplementation of spacer went on to have stable hips. Two patients who had intraoperative stable spacers developed spacer dislocation. Pseudarthroses in resection group remained stable in all patients except one who had early dislocation which we managed by realigning the fixator. There was no mortality. We eradicated infection in 68/73 patients (93.2%). We converted three patients of spacer application to resection arthroplasty. The mean Harris Hip Score improved from preoperative value of 43.3 ± 18.8 to 67 ± 10.4 (81.4 ± 9 in revision and 52.6 ± 11.8 in resection groups). Conclusions: We recommend Ilizarov supplementation in temporary spacers with intraoperative instability. Ilizarov fixator improves stability and helps mobilization of resection arthroplasty and staged revision using spacers done for chronic post-THA infections. Context: Limb lengthening has its own share of problems, obstacles, and complications, which is of great concern when used for a cosmetic indication. 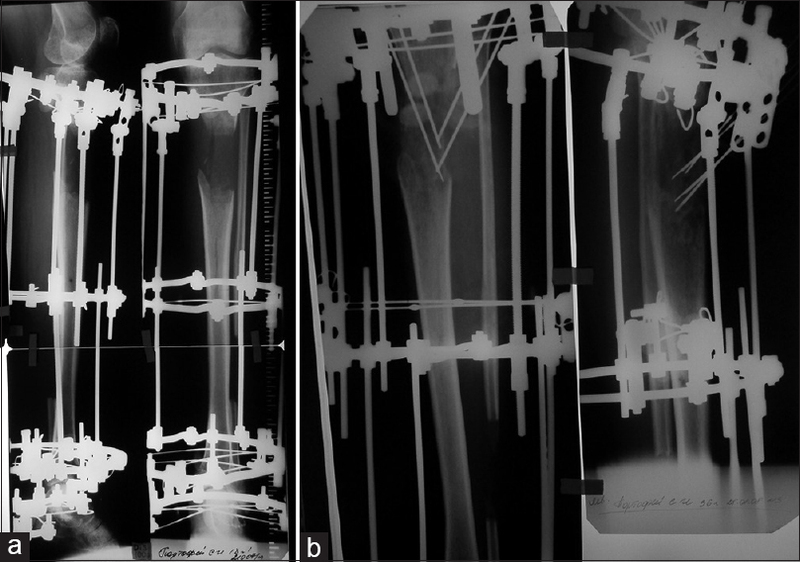 Aims: This study explores safe limits for cosmetic tibial lengthening and examines how age of the patient and length gained influences osteogenesis and complications. Settings and Design: This was a retrospective analytical study. 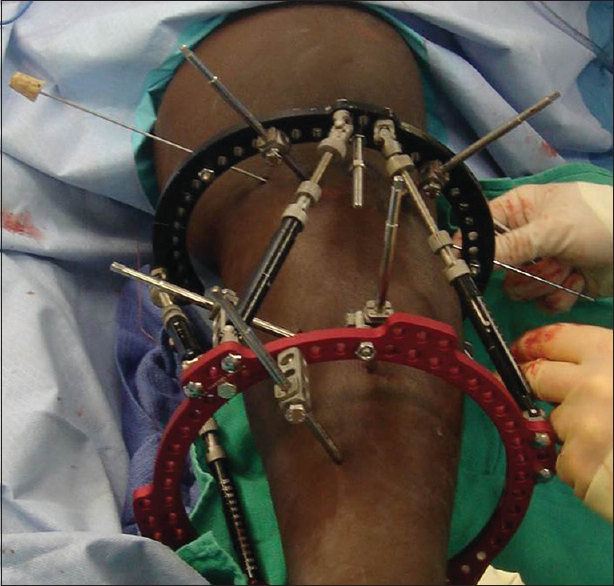 Subjects and Methods: We reviewed 70 consecutive cases (140 segments) of monofocal tibial cosmetic lengthening with minimum of 1-year follow-up operated between 2006 and 2010. Statistical Analysis Used: We correlated patient's age and percentage by which bone was lengthened with external fixator index (EFI) and occurrence of obstacles and complications and did receiver operator characteristic (ROC) curve analysis to determine the safe limit. Results: Mean age of patients was 27 (16–52) years. Mean tibial lengthening was by 16.5% (4.1–27.9) of the preoperative length. Sixty segments faced 76 difficulties comprising 16 problems, 47 obstacles, and 13 complications. Patient's age positively correlated with EFI, but did not correlate with the incidence of obstacles and complications. Percentage by which bone was lengthened negatively correlated with EFI and positively correlated with incidence of obstacles and complications. ROC curve analyses (with optimum balance of sensitivity and specificity) revealed lengthening by more than 18.1% and 16.4% to be significantly associated with the occurrence of complication and more than one obstacle, respectively. 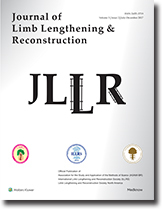 Conclusions: In cosmetic tibial lengthening, increasing age increases the duration of external fixation and increased lengthening increases obstacles and complications. Great caution must be exercised in cosmetic tibial lengthening beyond 16%. Background: Femoral fractures represent 2% of all fractures in children. While external fixation was popular for managing pediatric closed femoral shaft fractures, other methods have recently increased in popularity. The purpose of this study was to analyze trends in the treatment of closed femoral shaft fractures over the past decade and quantify the change in usage of external fixators compared to other treatment methods in the pediatric population. Methods: The Healthcare Cost and Utilization Project Kids' Inpatient Database (KID) was utilized to generate the prevalence of closed femoral shaft fractures and treatment (open reduction internal fixation, closed reduction, closed reduction internal fixation, open reduction, and external fixation) from 2000 to 2012. Results: The total number of reported pediatric femoral fractures declined from 10,504 in 2000 to 7,798 in 2012. Male-to-female ratios and mean ages were comparable between years. Overall, treatment with external fixation for closed femoral shaft fractures decreased from 2000 to 2012. There was a decrease in external fixation in each year recorded compared to previously reported years. There were no significant differences in treatment by region or hospital size. However, over the 12-year period, the rate of external fixation declined more rapidly in pediatric hospitals compared to nonpediatric hospitals. Conclusions: Treatment of pediatric closed femoral fractures with external fixation has declined in favor of internal fixation over the past decade across all geographic regions and in both teaching and nonteaching hospitals in the United States. This decline in external fixation occurred more rapidly in pediatric hospitals compared to nonpediatric hospitals. The clinical and financial impact of this change in practice needs further investigation. Level of Evidence: Level III. 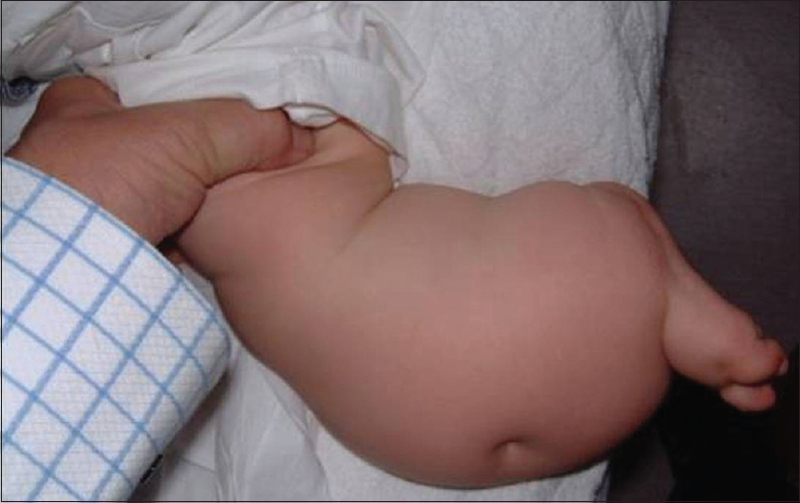 A 6-month-old infant presented with a soft tissue tumor (lipofibromatosis) of the right leg and procurvatum deformity of mid-shafts of tibia and fibula. He underwent deformity correction with Ilizarov fixator. He later had multiple surgeries for limb length difference and angular deformities of the tibia for more than a decade. At 12 years of age, his limb was well aligned with good function. Appearance of the leg was satisfactory despite lack of any surgical interventions for the soft tissue tumor. 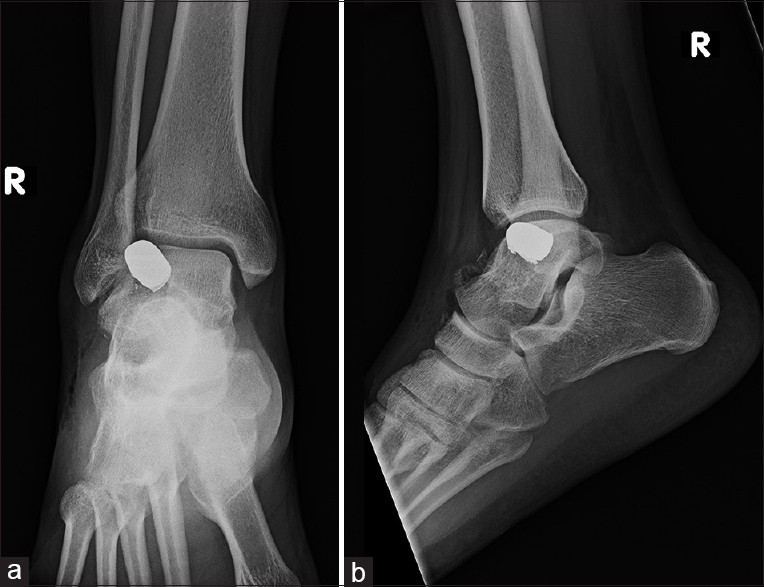 A 23-year-old male sustained a gunshot to the right foot with resultant talar body fracture and a 1 cm2 osteochondral defect of the talus. 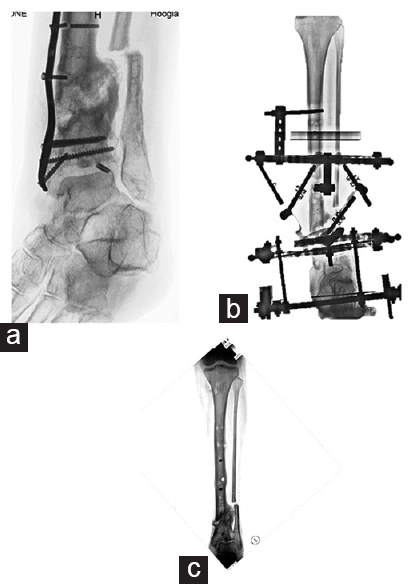 The patient was treated acutely with ankle arthrodiastasis using an external circular frame allowing ankle range of motion and full weight bearing while the fracture healed and the bone and cartilage graft incorporated. The circular frame was utilized for 4 months. At follow up, the patient was able to walk pain-free, the bone graft had incorporated on radiographs, and there were no signs of joint degeneration. We were unable to find any similar reports in the English literature of a young patient with a traumatic injury treated with ankle arthrodiastasis. This technique allows more normal function during the healing period than traditional techniques to reconstruct osteochondral lesions of the talus which require prolonged nonweight bearing. While primarily used for ankle osteoarthritis to date, ankle arthrodiastasis should be investigated for other indications to determine its utility in complex injuries.